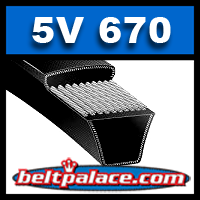 5V670 V-Belt. 5V "Narrow" Cross-Section: 67" Length, 5/8" Wide. Bando 5V670 Replaces all brands with same number. Home > Heavy Duty V Belts > Power Ace 5V-8V Section Industrial V-Belts > 5V670. 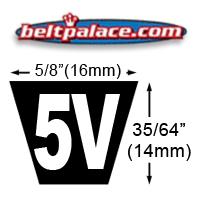 "Narrow" V-Belt, 5V Section: 67" (1702mm) Length, 5/8" Wide. 5V670 Industrial V-Belt. 5V Section: 67" (1702mm) Length, 5/8" Wide.